If you’ve taken a moment to poke around the App Store’s new iPad section, you might have seen some of the brand new programs proudly taking up some virtual space (Netflix, anyone?). More intriguing, though, are old iPhone favorites like Dragon Dictation. When it first launched last year, technology pundits and consumers alike couldn’t get enough of the app’s speech recognition features. Now, Nuance has released a universal port of the program that provides an update for iPhone and iPod touch users while introduce several new iPad-specific features. The Dragon Dictation 1.3.1 update, released Friday, uses Nuance’s NaturallySpeaking technology to translate spoken words into text on the device. On the iPad, this is especially useful if there isn’t a Keyboard Dock or Bluetooth Keyboard lying around, and you’re loathe to type on the device’s virtual keys. 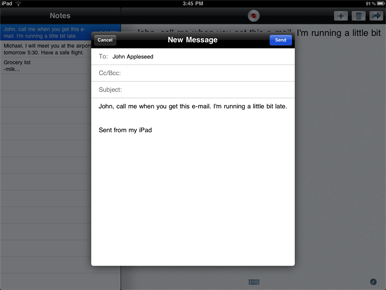 Users can dictate e-mail messages to the device, and the software will then format the message for your sending convenience. Exclusive to the iPad, Dragon Dictation offers a Notes section, devoted to translating your speech into documents, to-do lists, status updates, and so on. Dragon Dictation is currently available as a free universal app for the iPad, iPhone, and iPod touch and requires OS 3.1 or later.